This description of how a sandwich panel works, is written for someone with little engineering experience. Many assumptions are made to simplify this explanation. 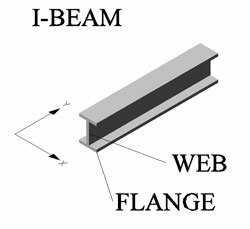 First, picture a simple I-beam where flanges are bonded to a web to create a structural member. When stressed, the two flanges are in tension and compression. This creates the majority of strength. However, an I-beam is most effective in bending in the plane defined by the Y-Z direction. A sandwich panel is much like an I-beam, but with the flanges and web extended in all directions. 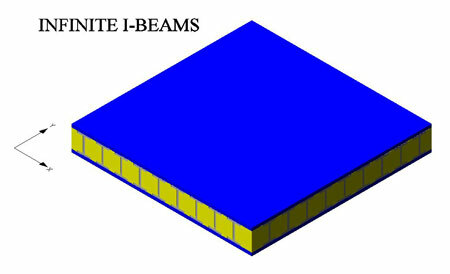 The skins of a sandwich panel correlate with the flanges of the I-Beam, and the sandwich core is similar to the I-beam web. However, because it is a panel, there is bending strength in all planes, not only the Y-Z plane (like the I-beam above) but also the X-Z plane, and any plane between. When a sandwich panel is bent, one skin experiences tension, and the other skin experiences compression. This is where the majority of strength is created in a sandwich structure. The core functions to hold the skins together, so the panel doesn’t buckle, snap, deform, or break. The core keeps the skins fixed and relative to each other. The main stress the core experiences is “shear stress”, as the two skins attempt to slide past each other. The stiffness of the core is determined by the core material “shear properties”. The stiffness of the panel is mainly determined by the core material properties and the thickness of the core. An easy way to demonstrate the core is to picture a paperback book. When the book is bent, notice how the pages easily slide past each other. If the pages were then glued together, the book would instantly become very stiff, because when bent, the pages could no longer slide. Instead, the pages on the bottom half are in compression, and must squeeze together. While the pages on the top half are in tension, and must stretch apart. Flexible cores that bend easily are known to have a “low shear modulus” while very stiff cores have a “high shear modulus”. If the glued paper back book is bent enough, eventually the side in tension will crack and fail. 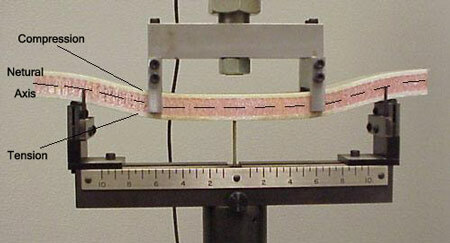 The top layer of paper will tear when the “tensile strength” of the paper is exceeded by the bending force. A solution to this would be to bond another material to the surface, creating a skin with a higher tensile/compressive strength. This skin would work in conjunction with the core. By doing this, a composite sandwich panel is constructed. If a sandwich panel is bent downward, the part of the sandwich above the neutral axis will stretch, and the part below the neutral axis will compress. Although the skin and core stretch and compress evenly at the location of the bond, the core and the skins have different material properties, and will in turn act differently to this bending.